In this tutorial, we look at a one easy step to a cleaner mix you can employ straight away to get your mixes sounding cleaner and easier to mix. Taking you through the concept of Subtractive and Additive mixing this video shows that by employing the use of the High Pass filter, or sometimes known as Low Cut filter to surgically tackle troublesome sounds. Typically when mixing the instinct is to reach for the volume faders to get sounds more prominent in your mixes, but this quickly degenerates into a contest with ever diminishing returns. In the video you’ll see why the approach of “Less is More” will help to make your mixes more coherent and cleaner sounding. By following this simple step and applying it to sounds in your productions, you’ll quickly notice a huge difference in that not every sound will be battling for it’s own space, that low end sounds you want will come through and that everything will sit more comfortably within your mix. 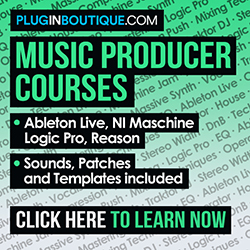 Every DAW has its own built in EQ facilities so once you watch the tutorial you can then dive right in and start applying the principles straight away. Pretty soon, you’ll be applying Subtractive mixing as second nature and even if this feels counter intuitive at first, you’ll notice the difference it makes. So here we go with one easy step to a cleaner mix.